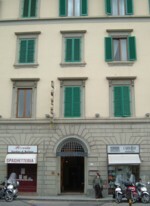 Florence is not a cheap place to stay, but the general standard of accommodation is higher than in some Italian cities. 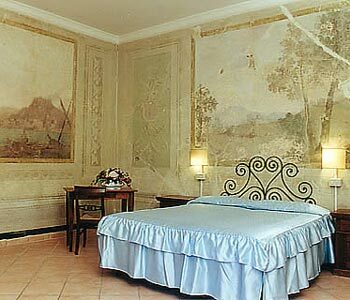 Tourist hotels in Florence know their stuff and they are used to overseas guests with demanding requirements. As well as comfortable hotels, Florence also has a range of B&Bs, offering more basic bed and breakfast accommodation to travellers on a budget. We have selected a few recommended hotels, and a B&B, which are featured below. If you have been touring Tuscany with a hire car, consider returning it at the start of your stay in Florence, or staying outside the centre of town. Italian city centres have narrow one-way streets, restricted access and expensive (and limited) parking. City hotels do not normally have their own car parks, and will charge extra to park your vehicle in a nearby facility. Read the hotel pages for more information and contact the hotel if you need detailed driving directions. 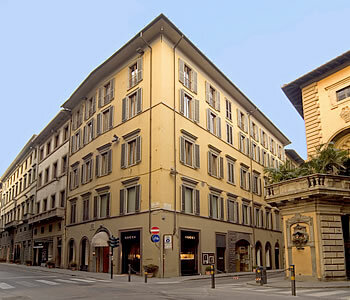 A really smart four-star hotel just a few yards from the Ponte Vecchio. The location is ideal, service standards are very high, the rooms are extremely comfortable and the breakfast room has a frescoed ceiling. All you could really want from a hotel in Florence. A good three-star, like a smart version of a traditional pensione, on Florence's most exclusive shopping street. It's in the heart of everything and offers quite good value for money. 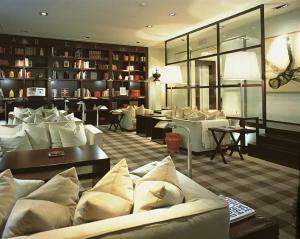 Hotel Caravaggio is a smart and friendly three-star hotel with excellent reviews from past guests. It is located at a short walk from Florence's main railway station, and is a convenient and comfortable place to stay, although it is a longer walk from the sights than our other recommended hotels. 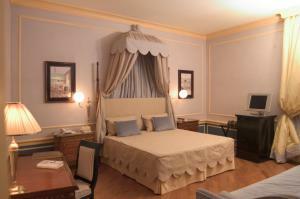 We stayed at the Caravaggio a while ago, and were very pleased with our choice. 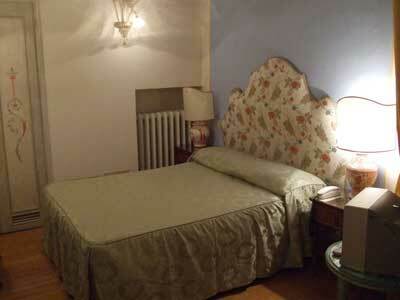 Sani Tourist House is a small bed and breakfast in the heart of Florence. Well-equipped rooms make for a home-like stay in this third-floor apartment close to where Dante once lived. I've stayed at the B&B a couple of times and would recommend it. 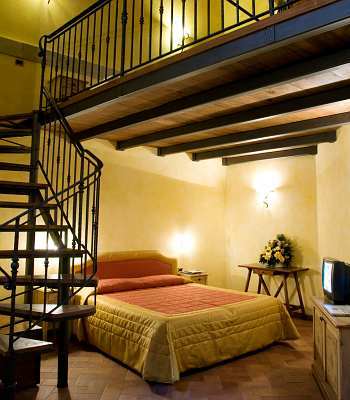 This is the hotel to choose for a honeymoon in Florence, or for or simply a luxurious break. Outside the crowded centre of town, it is a great place to stay for travellers who wish to return to a tranquil, elegant base after a day of tourist sightseeing. It would make an especially good choice in the hot summer months, when the levels of tourists in Florence's streets can become uncomfortable. 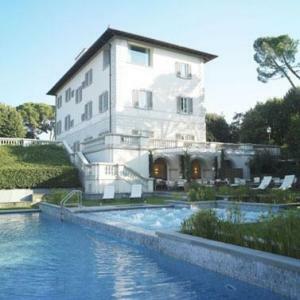 Villa La Vedetta is situated near the viewpoint of Piazzale Michelangelo, and - making it unusual for a Florence hotel - it boasts gardens and a panoramic swimming pool. Book ahead, as the hotel only has 18 rooms and suites. 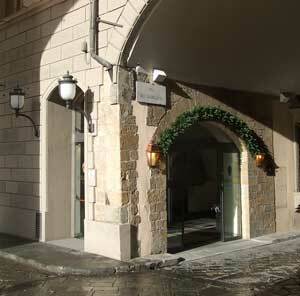 A comfortable four-star hotel on Via Tornabuoni, close to the Tornabuoni Beacci (described above). This is a good location and the hotel is a safe choice with a reputation for helpful staff. Ideal for shopping and sightseeing. This classy four-star is situated on Piazza Santa Maria Novella, by the church and very close to the railway station of the same name. It's a good location for travellers, though it can be a little noisy. The hotel is a hard-working and ambitious place offering extras like slippers, wireless internet, tea/coffee making facilities and breakfasts which are praised by past guests. A renowned 'design hotel' hotel, the Gallery Hotel Art is a trendy and stylish pad close to the Ponte Vecchio, making it ideal for old-fashioned sightseeing as well as soaking up the hip artistic vibes. The hotel has a trendy restaurant/bar, and hosts art exhibitions. See more hip hotels in Florence. 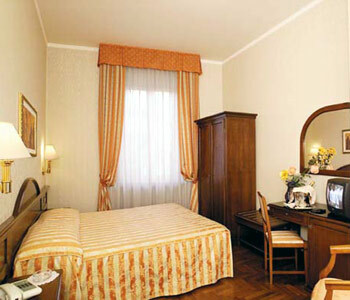 The three-star Boccaccio is a value-for-money hotel just a few minutes' walk from Santa Maria Novella railway station. It's a practical and affordable option, and although you're not in the middle of Florence's sights, they're all within walking distance. This is a busy hotel district and the Boccaccio stands out for its favourable reviews. On the same street as the Hotel Boccaccio (above), the Alba is another three-star with good reviews, reasonable prices and a convenient location for travellers. The hotel has a modern feel and more facilities than many three-stars. 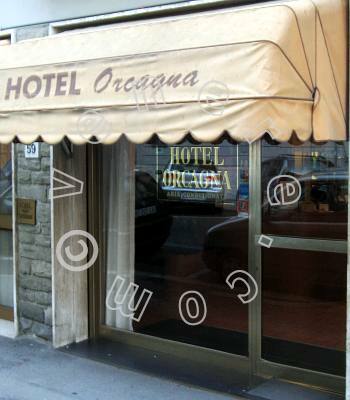 Hotel Orcagna offers budget two-star accommodation on the opposite side of the historic centre to the main railway station and hotel area. It's still only a short walk from the heart of town and a bus-ride from Santa Maria Novella station. Although rooms are small, this hotel has favourable reviews from past guests and could be a good cheap option for travellers on a budget. 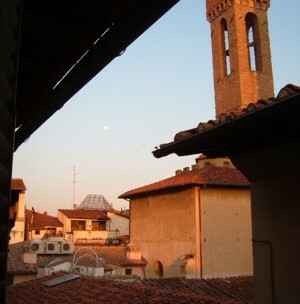 Like so many other Florence hotels, the Hotel Balcony is between the railway station (Santa Maria Novella) and the heart of town. It's a convenient and cheap base for a sightseeing trip, and although you shouldn't expect luxury it is good for a two-star hotel. Guests praise the friendly and helpful proprietor and his staff. Italian one-star hotels can be pretty basic, but if you are on a tight budget the Bavaria is a decent option. It is right in the heart of the historic centre, making it ideal for exploring the sights and picturesque evening strolls - some rooms even have views of the Duomo. The cheapest rooms don't have ensuite showers; shared facilities are reported to be clean by past guests. Note that there are lots of stairs to negotiate.